The Bobbilicious Files: Finally some Pictures! Well, here are some things I made while the computer was down. 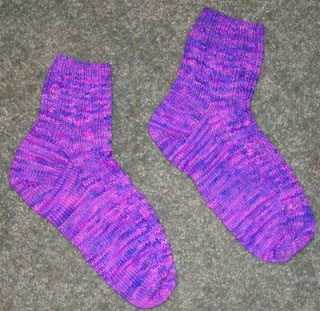 The bright pair of socks are the BFF pattern from Cookie A. They were so nice and relaxing to make. Jennie and I did it as a KAL - appropriate since the yarn was a Christmas present from her. The darker pair are the Coiled Cable and Rib pattern from Knitting up a Storm. I finally made a pair with cables down the heels - very cool. 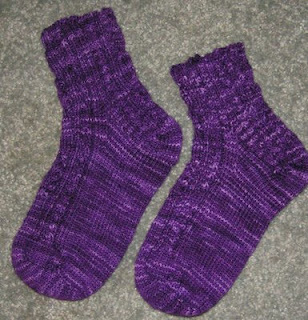 I gave this pair to mom as a gift for her aunt - I'll be knitting up another pair for myself, though. They're really pretty and the pattern kept my attention - no wantering bad thoughts! The top is the B'licious tank that was designed for me. I'm the first to make one - it's wonderful! 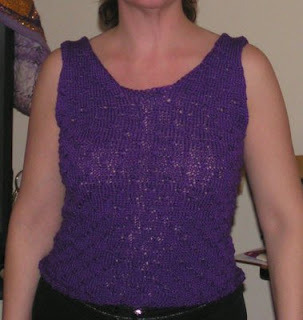 The stitch pattern is stretchy and comfortable and it's kind of dressy but not too much. I really want to find a pretty skirt to wear with it - someday I may need to look nice, you know. I had a bonding moment with my girl child last week. We went to get our ears pierced together. I now have three holes in my lobes and a right upper piercing. She's trying again - the last time her ears got sore and we had to take the earrings out. We got matching CZ's - we like sparkles. When I got my ears done the first time my dad took me and my sister and then got us diamonds for Christmas. Maybe now he can get his princess some diamonds for her little ears. I told her that she's too young to go to a tattoo place but I'd take her to get one when she's old enough - if she wants. Heh, maybe we can get matching ink! I joined Twitter this morning. I'm feeling rather in touch right now. I'm actually not at all a computer-savvy kind of person. In fact, I can't even find the cheat sheet for adding a text link for the patterns I mentioned above. But now I can tweet! I think there's a link here somewhere - I clicked on the profile page to connect my twitter to here. Add me to your list and I'll add you to mine - we can all get to know each other better! I just checked - no link. I'll see what I can do. Meanwhile, I'm MsBobbilicious there. Socks and tanks and kids growing up... so much going on. Let's eat chocolate and knit more stuff. Or we could... *gasp* make zines! heehee!